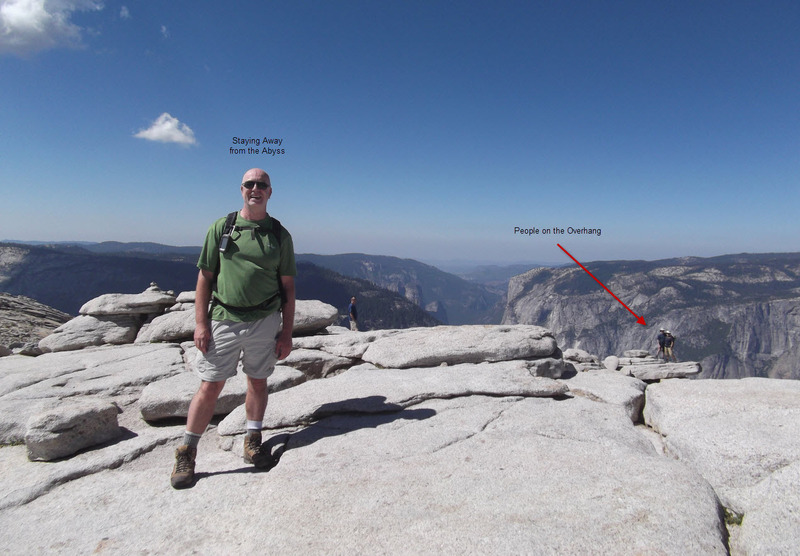 Half Dome was the physically hardest hike since summiting Mt. Whitney some 20 years ago when I was a much younger man. 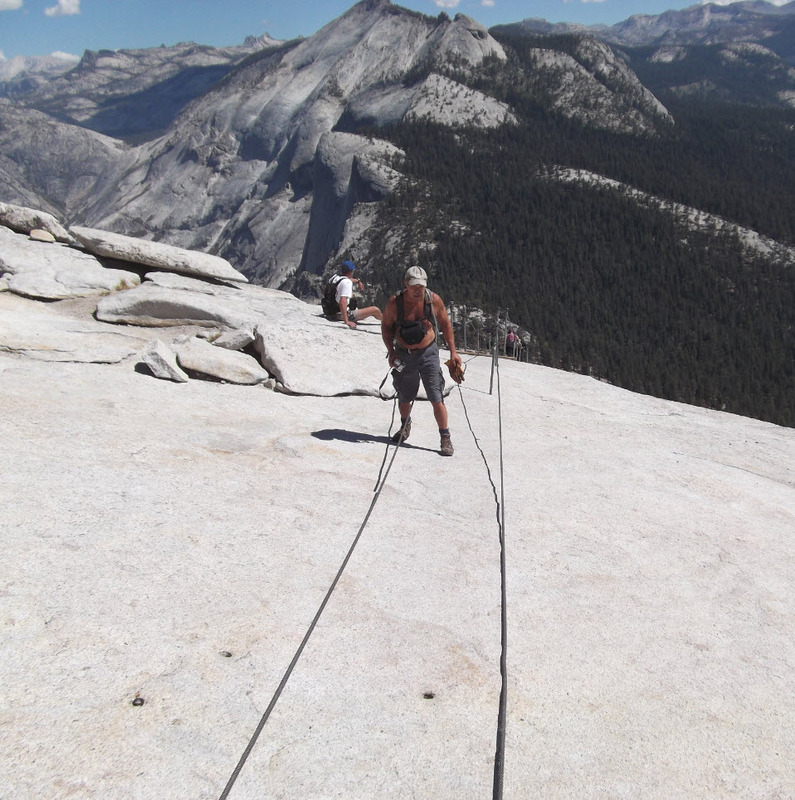 Ascending the infamous Half Dome cables was also the scariest thing I have ever done, worse than technical rock climbing and skydiving. This hike is listed in Backpacker Magazine as one of America’s 10 most dangerous hikes. The hike from the parking lot at the trailhead and back was 18.3 miles, starting at an elevation of 4,000 feet and topping out at 8,840 feet, a huge elevation change for a day hike. We started at 4:00 am in total darkness, and I came limping and dragging back to the parking lot at 6:00 pm. “Younger people” can usually do it in about 8 – 12 hours. We are not “younger people” anymore. It is not my intent for this post to be a guide for other hikers, but rather a narrative of my own experience. “Mr. 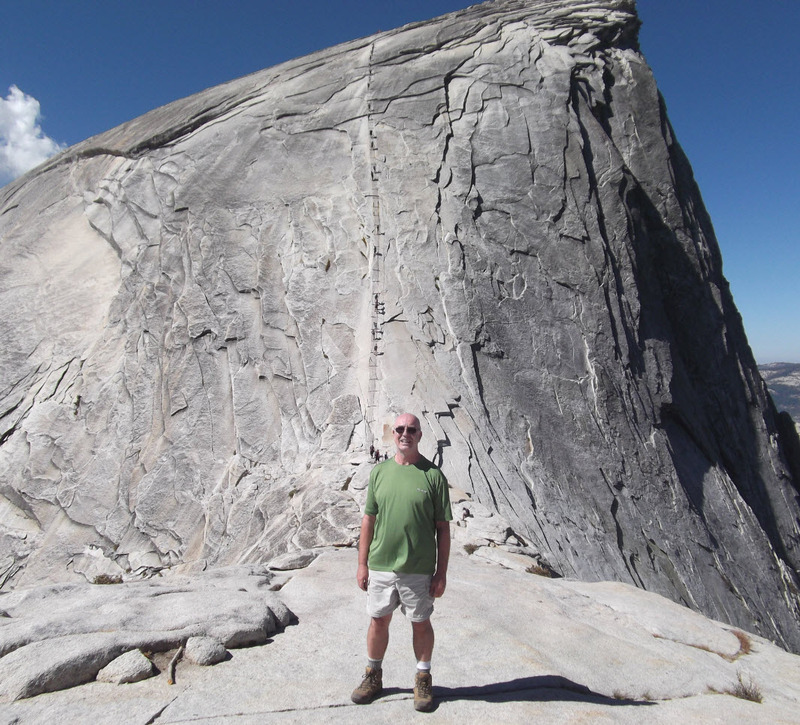 Half Dome”, Rick Deutsch, does a much better job, both with his website, blog, videos and his book Yosemite’s Half Dome. I highly recommend all if you are seriously planning hiking Half Dome. When entering Yosemite through the main tunnel, the vista is breathtaking. Yosemite is one of the most spectacular and awe-inspiring natural places in this country. 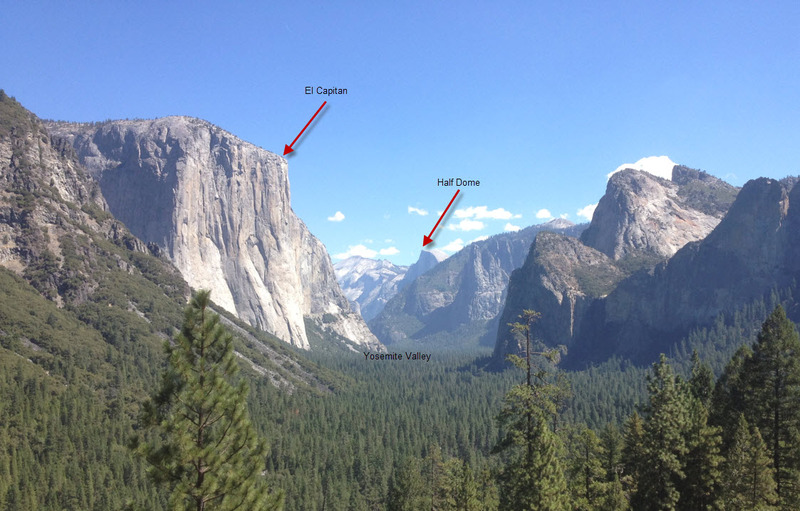 On the left you can see the famous El Capitan, a 3,000 foot sheer rock wall. 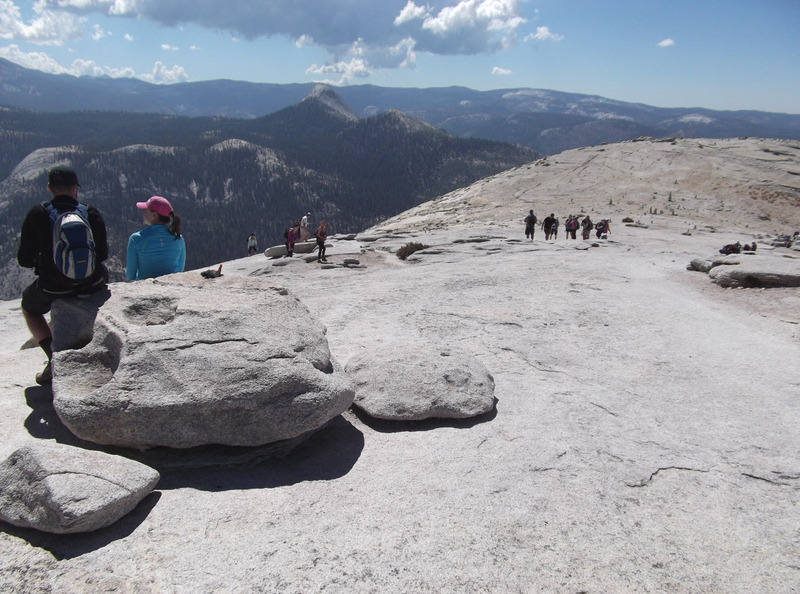 In the background, overtowering the valley and everything around it is Half Dome, our final destination. 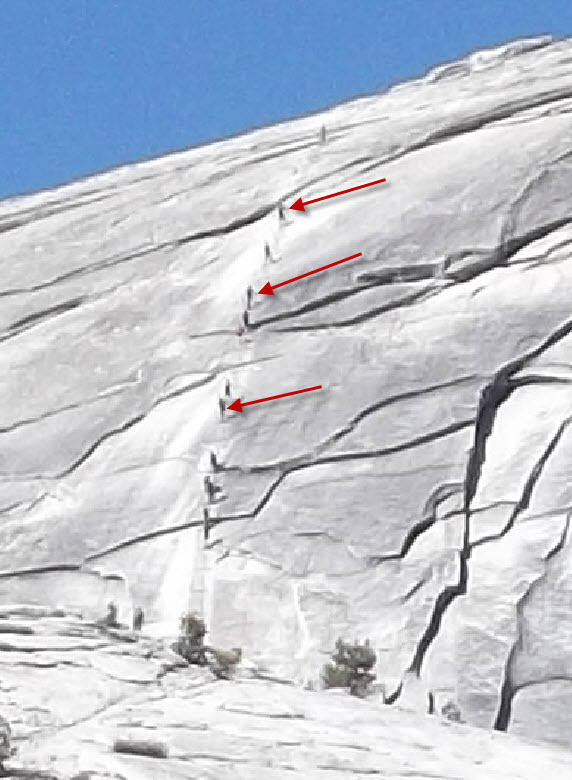 The north face of half dome is a 2,000 foot wall of vertical rock. The weather looks good for a climb on September 11th. Here is where we’re planning on going, zooming the camera in from the valley floor. It’s really 4,800 vertical feet above where we’re standing. Hikers come up from behind the dome, from this viewpoint. In recent years it has gotten so crowded on this trail that now permits are issued and strictly enforced by an armed ranger. Since there are many more applications than slots, a lottery is used. 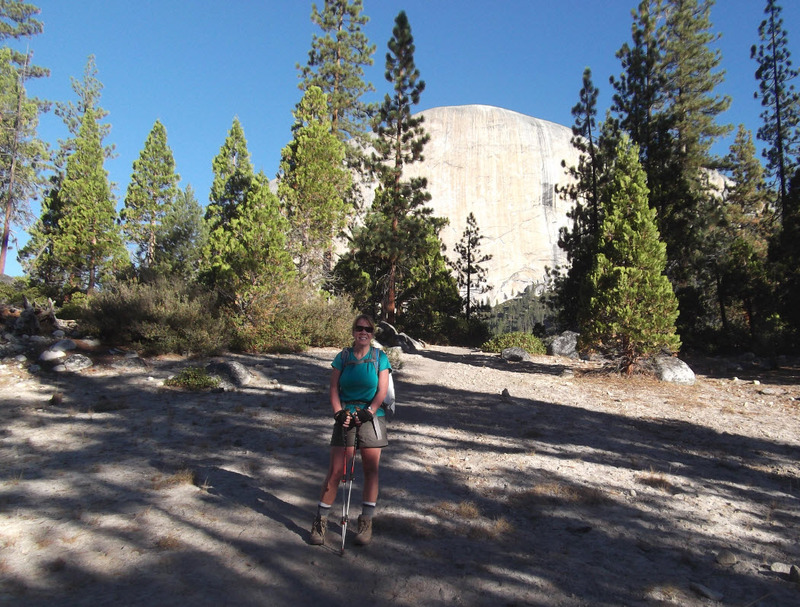 Trisha applied in April and promptly won us slots for her birthday bucket-list hike on September 11th. I didn’t even know this was on my bucket list. 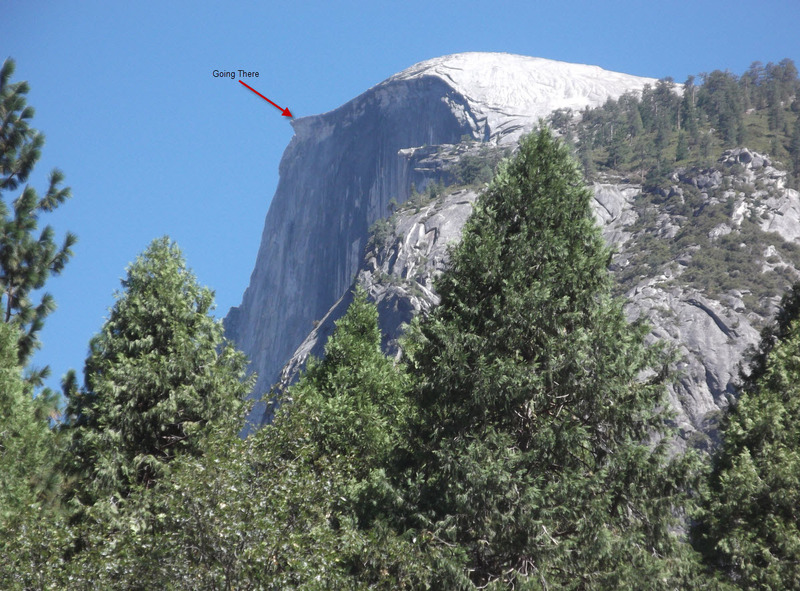 Half Dome is listed as “strenuous” or “very strenuous” in every description. It was pitch black when we got on the trail at 4:00 am. We turned the lights off and I took this flash picture. The reflectiveness of the sign turned Trisha into a ghost. With headlights we only saw the next 10 or 20 feet in front of us. Turning off the lights left us in complete blackness, with the stars as bright as I have ever seen them overhead, accompanied by a sliver of a moon and Venus nearby. 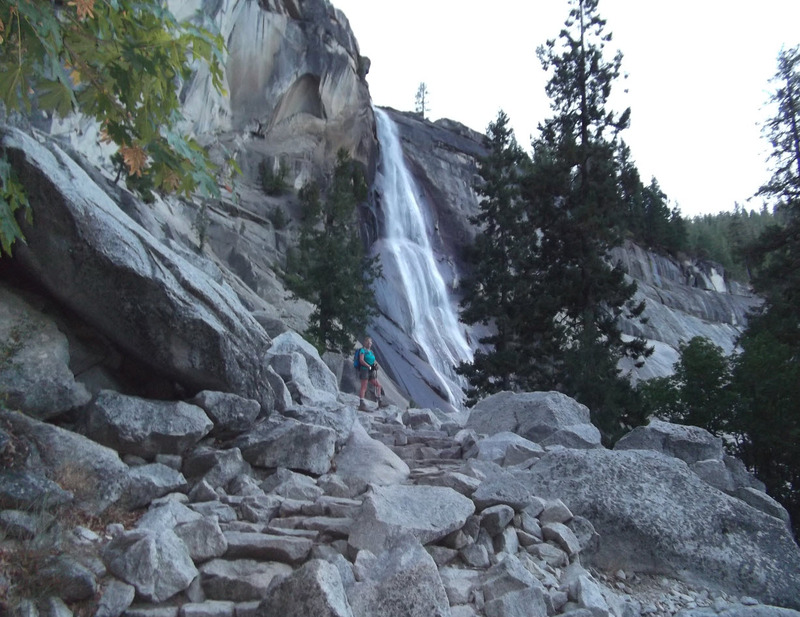 For two hours we hiked up the famous mist trail past Vernal Falls, one of the most scenic hikes in America, and saw nothing at all. We even lost the trail a couple of times and needed to use to GPS to find our way back. Sometimes it’s hard to find the trail in daylight. Try total darkness sometimes. It’s a very uncomfortable feeling to be lost in dark woods next to thunderous waterfalls and sheer drops of hundreds of feet all around. Around 6:00 am we finally got some light. By now we had passed through the most scenic part of the hike in darkness. 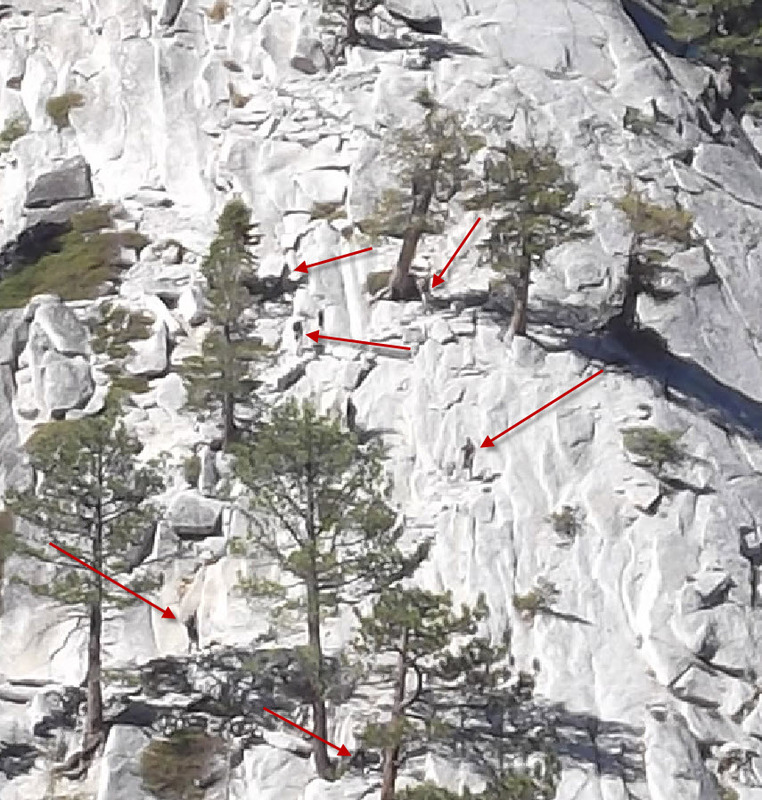 At least we saw Nevada Fall right here. You can see some of the rough-hewn steps here. There were hundreds and hundreds of those leading up the cliffs. Now we are in “Little Yosemite Valley.” There is a nice campground by the Merced River, and this is the last source of water. About halfway up. 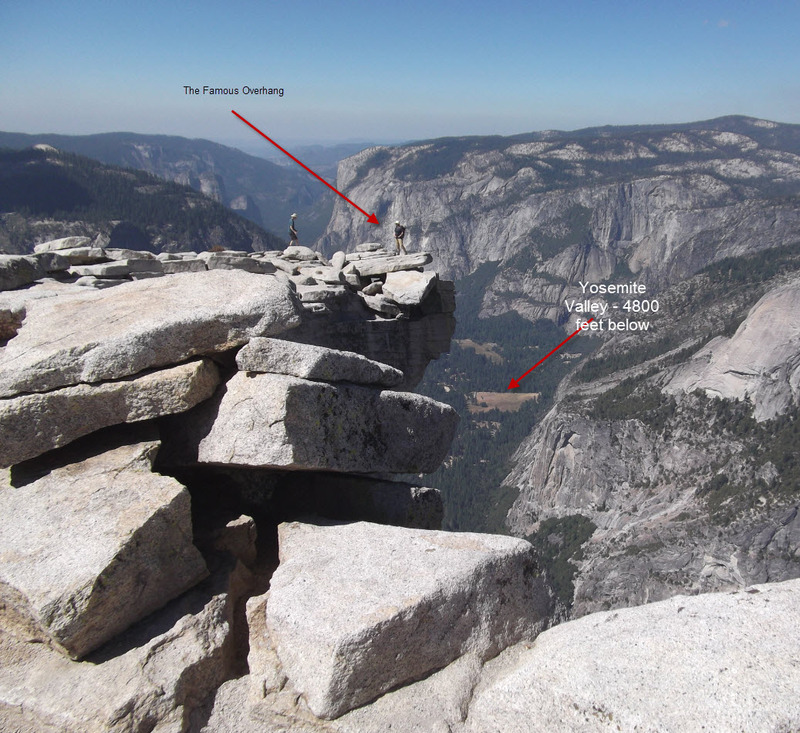 The top of Half Dome, from the back, still 3,000 vertical feet up and four miles away, is looming. At 9:45 am we were at about 6.5 miles and 7,200 feet altitude. It was time to take inventory. Our non-negotiable turn-around time was to be at the cables by 11:00 am. Any later would jeopardize the hike and the ascent could get too dangerous, due to crowding, as well as weather. Thunderstorms or rain on the dome has been fatal to many a hiker and climber over the years. Trisha decided at that point that she did not have the strength to continue up the slope, with only an hour to go, let alone deal with the dome itself. The only responsible thing to do was to start the descent. I need to add here that many people somewhere along the way decide they have to turn around. I don’t know what the statistics are, but I assure you, the hike is much harder than most people anticipate. We split up; I got into high gear and powered on. After another 20 minutes up endless switchbacks, there is a flat ridge at about 7,800 feet altitude. Half Dome sat majestically, with the famous subdome in front of it. 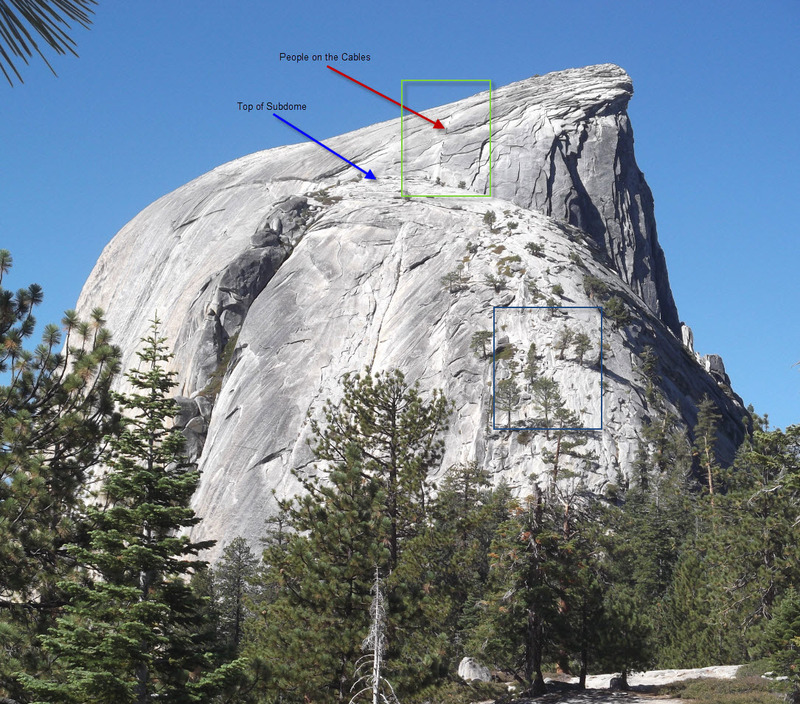 You can see the red arrow pointing to the cables on Half Dome and the blue arrow to the top of the subdome. 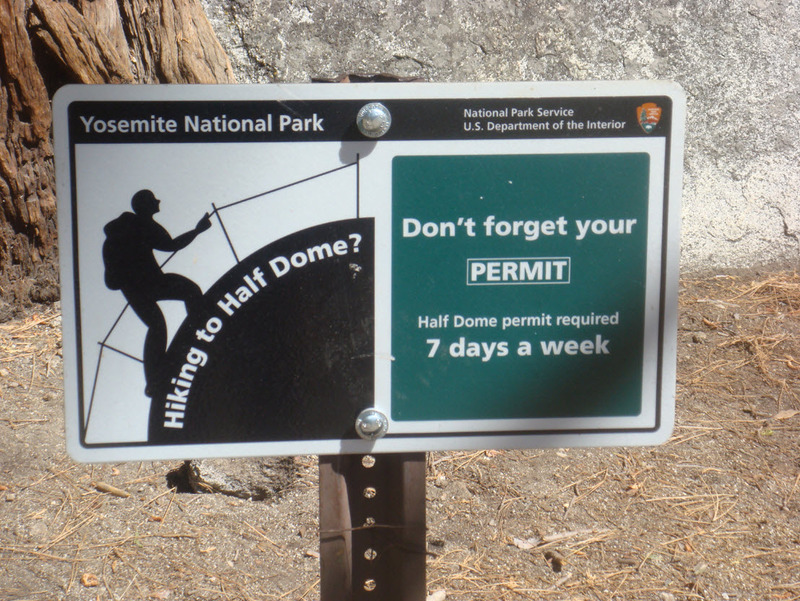 Climbing the subdome is almost as scary as Half Dome itself, going up hundreds of rough, single file stone steps, some a foot high or higher. Toward the upper part of the subdome, the steps peter out and all that is left is steep, grey slab of granite to walk on. Click on the image above to enlarge. You will see I have boxed in the cables section in green, and a section of the subdome in blue. There are people all over those two boxes, you just can’t see them unless I point them out. I know it’s hard to see, but there are people all over these pictures on the wall. I have pointed out six of them with red arrows. You can now click again on the large picture above and pick out more people on the subdome, now that you know what you’re looking for. When you now see the people on these zoomed pictures, it puts the original picture into perspective. Now I am on top of the subdome, which is marked by the blue arrow in the picture with the boxes above. Climbing the subdome was extremely exhausting. I would take 10 steps, stop and pant, try not to look down behind me the seemingly vertical wall. Another 10 steps. Don’t look down. Don’t look up. Focus on each step. Don’t slip. Don’t get dizzy. Finally, on top of the subdome, shown here, there is nothing left to do but put on the gloves, gulp down some water, eat a quick power bar, and get on the cables. I did not take any pictures while on the cables. I can only tell you about it now. It took all my courage and resolve to walk up and get started. The slope is about 45 degrees, a bit steeper in the middle, less on both ends. The altitude is over 425 vertical feet to the top. Looking up, it looks straight up. Looking down brings on vertigo. I resolved to do neither. There are 68 posts, about 10 feet between posts, and 2 x 4 wooden slats at each post. So you pull yourself up using both arms on a steel cable thicker than my thumb. Strong gloves are absolutely required. Hands could not take it and skin would be gone in minutes. Feet solidly on the ground, walking up while pulling up. I could only do one post at a time and I needed to stand there and rest, breathe, relax the arms and hands. I could not have gone faster, since the traffic jam of people going up and going down slowed things considerably. There were some people, less than half my age, in complete panic and almost frozen with fear, clinging to a post, refusing to move. I wished I had brought my climbing harness to clip in. Without a harness, slipping and falling for any reason would be deadly. Slipping could be induced by somebody above losing control or dropping something. When the rock gets wet, it’s like a sheet of ice, and the only thing left is upper body strength and hand strength. Somewhere half way up, standing calmly and resting on a post, I realized how utterly exposed I was, along with 30 other people on the cables with me at the time. Lesson to self: Next time, bring a harness and clip in. It’s the difference between sheer panic and peace of mind. Now that you have a sense for what it was like, you will understand why I didn’t pull out a camera and took pictures while on the cables. I would have had to look up, look down, look around, let go of the cable, and take incalculable risks. To the right you see a couple of guys standing on the famous overhang. I cannot go near the abyss myself. I am happy just staying away from the edge. Here is another angle of the overhang. People step out and look down, 4,800 feet to the valley floor below. A giant void unlike anything I have ever experienced before. I could not let myself get closer to the edge than this (about six feet or so). Here is a view into the west. 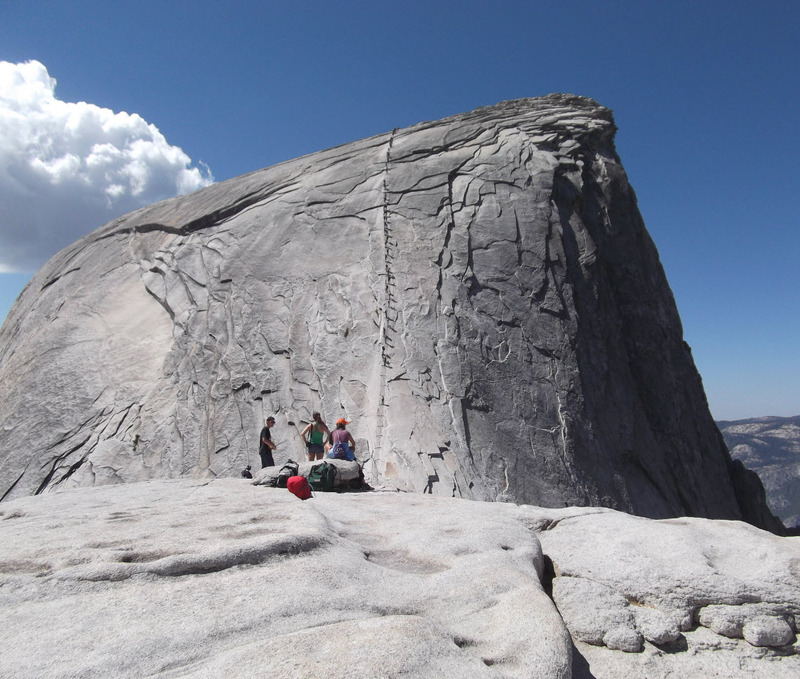 The top of Half Dome is said to be as big as 17 football fields. People have played frisbee up here, but don’t leap after it if it goes over the edge. Clouds were coming in, making me scared. And knowing that I’d still have to go down the cables, which is a whole other experience, I could not relax sufficiently to enjoy much of my stay. Here is the view from the top of the cables, before they curve down into the void. Just as on the way up, I resolved to take it one post at a time. Don’t look down, don’t look around, since the void curves away in all directions. Try not to burn the gloves. Try not to slip. Carefully navigate around any people frozen in their fear, up or down. Finally, 30 minutes later, I stepped off the cables, and told myself that I was glad that I had done it and that I would never, ever want to do THIS again. One look back, now relaxed and satisfied. Been there, done that. Never mind that I had to get back down the subdome, and the other eight endless miles to the valley. Slowly, surely, I’d get there, about six long hours later of relentlessly pounding of the knees and feet. The next morning, I point up to where I just was. See, it can be done. And about never again: We decided that this was just a practice hike. We’re already planning to apply for Sept 11, 2013. We’re getting permits for a party of four. Any takers for the extra two? I now know how to train you up. Nice photos and descriptions–makes me want to go even more! Congrats! 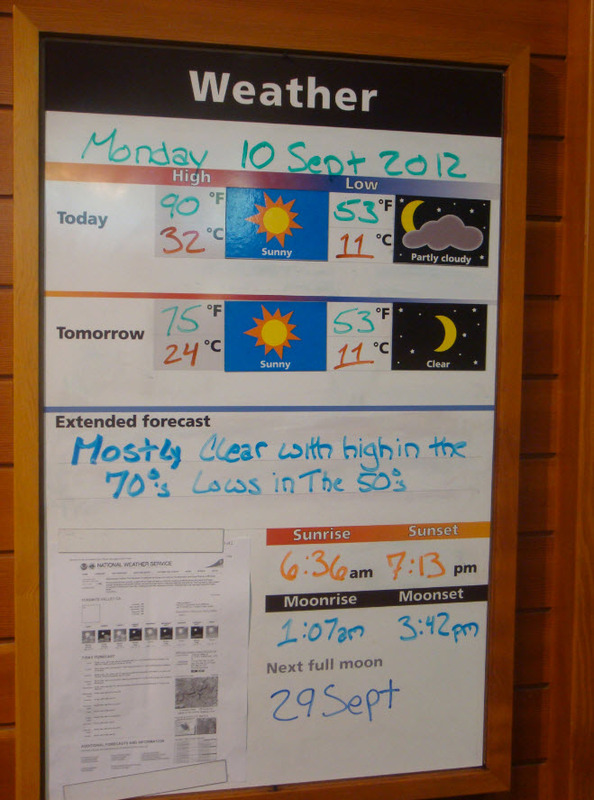 on September 14, 2012 at 1:52 pm | Reply Jim D.
A good story and photos Norbert. But don’t count me in your next climb. This post made my hands sweaty and my heart pound just reading it! Sounds like an incredible hike. If you were to do it again would still start in the middle of the night? I would think I would enjoy seeing the scenic part of the hike. 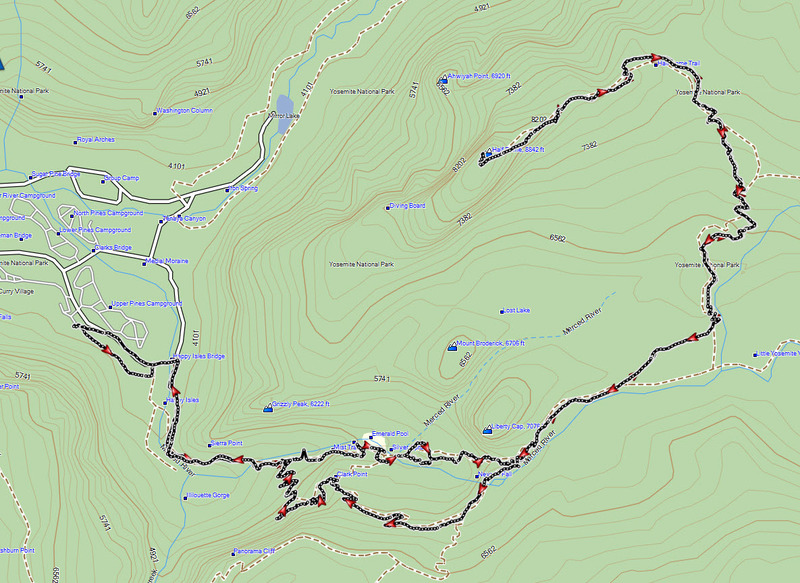 Do people ever hike half-way and camp at the base or is it required to do all 18 miles in one day. You can camp halfway up in Little Yosemite Valley. Permits are given by lottery, too, and with it comes the permit for summiting. This would cut the dayhike in half, to about 8 miles up and down. 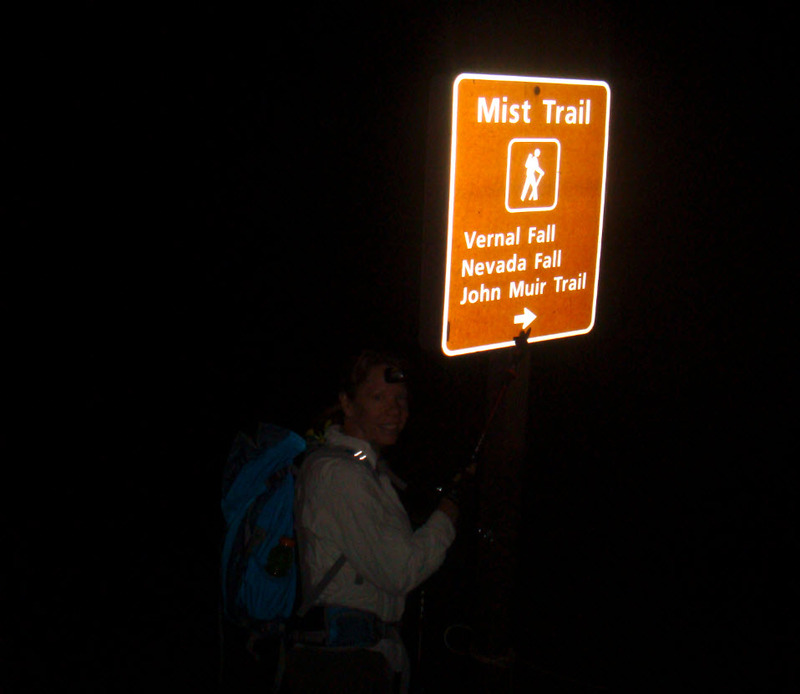 Otherwise, I would again leave at 4:00am, but I would take the non-scenic route up, the John Muir Trail, which is a mile longer but much easier to hike, especially in the dark. To get the scenic sights, I’d make a dayhike just for that. Doing the summiting, and doing sightseeing and enjoying, on the same day is too hard and too stressfull. Make it two days, two separate hikes. Sounds great! I talked to my husband about it today. He said its definitely on his bucket list too. Good luck, and let me know. Remember, you need to apply for permits between March 1 and March 31 every year, and then get lucky and be chosen by the lottery. Norbert, thank you for writing this and letting us share a little in the action with you. My stomach is still in knots! Wow, you and Trisha should both be very proud of your accomplishments! OMG! I never made it, when I was 20 and in peak condition, those cables were too much for me. I don’t know if more upper body workouts would have helped because my short legs didn’t like the granite bolder steps either. Fantastic account of your trip. Absolutely unbelievable accomplishment! You two are going to be known as “The Mountain Goat Couple” in my book! Tell you what; I’ll volunteer to wait in the cabin for you guys…with a nice bottle of wine to celebrate your next adventure. That’s about as close to the mountain as I’m gonna get. I’m happy looking up in amazement. Never. No desire. I’ll look up from the valley floor, thank you very much. Norbert – An AMAZING job…congratulations on your conquest!!! I am so proud of you and Trisha and applaud you for even considering another attempt…just looking at those pictures made me queasy! My mountain climbing experience up snow and ice seems like a piece of cake compared to sheer rock. Very eloquent account…you should be a travel writer! Yep. If we had not started at 4:00am, we would not have been able to do it :). Thanks so much, Peter. I am honored. I have done the hike in two days to the top with camping in little yosemite valley, made for a more relaxed hike knowing that I could stop and enjoy the scenery more. Plus I did not make it the first time I went in one day. It did force my hiking party to carry larger loads with camping equipment and food- and of course I have a bear story from that camping experience! Awesome pictures and perfect descriptions, makes me want to go again! Oh, thanks so much for sharing. Yes, I have been eager to go back. 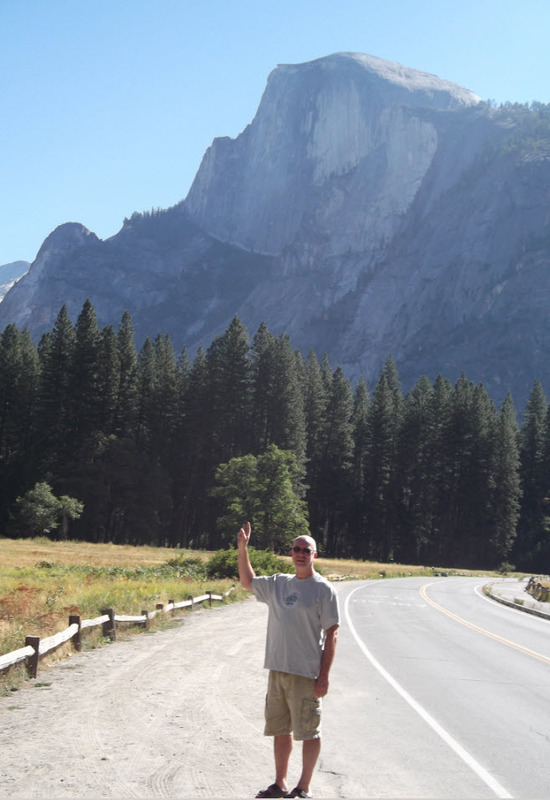 Although, next time I am doing the JMT starting in the valley, so I’ll just wave at Half Dome and move on :).